I’d known about these abseils for some time but didn’t quite know where they were. 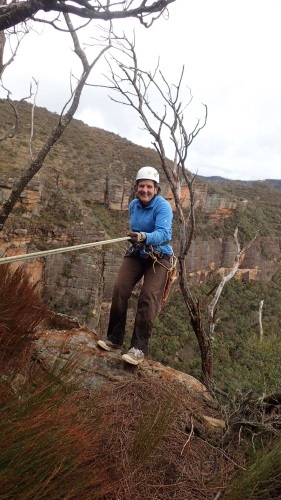 When a trip came up on the calendar for Upper Blue Mountains Bushwalking Club, combining Africa Walls, Kilimanjaro, Skinny and Moss Pit, I jumped at the opportunity to do these abseils. I would be leaving home around 7am to make it to the rendezvous point by 9.30am. Note to self – in the future, don’t go out for dinner, eat rich food with lots of cream sauce and drink too much red wine before an abseil trip, I woke up decidedly seedy. I downed some Panadol, drank copious amounts of tea and skipped breakfast. Stopped off at Maccas to get more tea and by the time I arrived at 9.30am I was feeling half-way decent. I’d already abseiled with four of the group before (the Leader Jim C, his wife Lyn plus Aine and Colin G), plus I’d been acquainted with Geoff F via email for a couple of years, so I felt right at home with the group. • Moss Pit – because of a beautiful wall of moss. 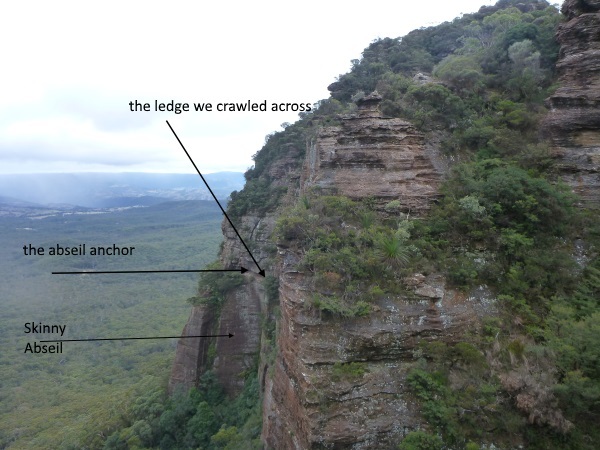 • Skinny – because the huge ‘crack’ in the cliff line is ‘skinny’ compared to ‘fatty’ which is the next break in the cliff line … when looked at from across the valley. • Africa Walls – because (when viewed from across the valley) the cliff-face looks like a giant map of Africa plus there’s a big slab (flake) of rock at the bottom. • Kilimanjaro – following the Africa theme (which is really the second pitch of Africa Walls) … is an overhang and has a huge roof … and of course, Mt Kilimanjaro is known as the roof of Africa. The Africa theme of the pitches came about because the site/pitches reminded The Guys of the Africa Flake pitch which was mentioned in the book Climb to the Lost World which they’d both read – it’s the story of some of the most famous British climbers ascending Mt Roraima (in South America), 1k high crag of sandstone. We headed down to the cliff top on a nice well-worn track which was new to me. The track then took us down beside a pagoda and to a small gully. 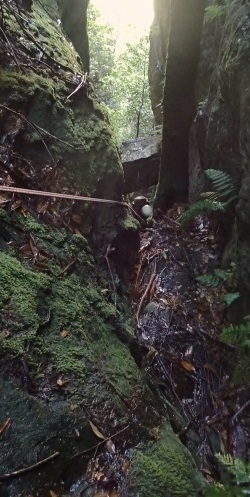 The gully became a creek and eventually passes through the cliff line in a narrow slot. 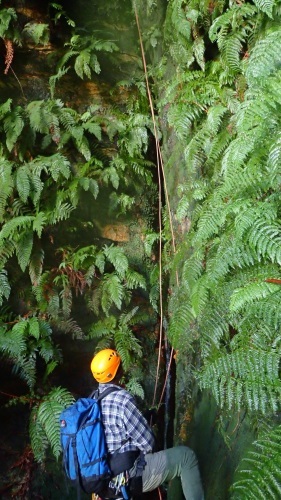 The slot is Moss Pit (17m) and it was lovely, very mossy and lots of ferns. It would be quite dry most of the time but because of all the rain we’d had, it was very, very wet and muddy. 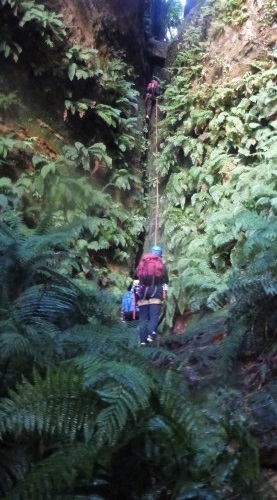 We all started the abseil warm and dry, but by the end if it, we were all cold and wet. Someone remarked that the first time they’d done Moss Pit, there was more moss and they felt that it had had seen a lot of action, although there wasn’t a well-beaten track to it there were definite wear marks on the lovely mossy wall, evidence of poorly placed feet over the last 10 years. 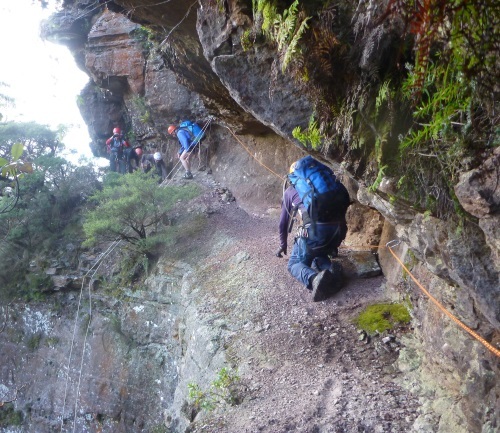 Once down Moss Pit, you walk down the creek a little further and then around underneath the cliff-line, aka the Wombat Traverse ledge. 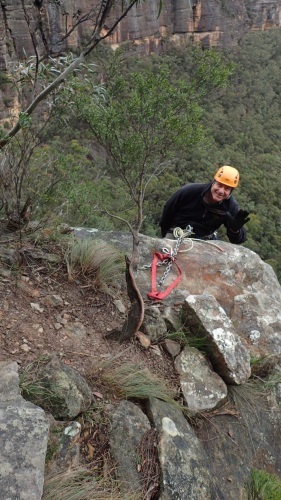 Wombat Traverse, we had a safety line rigged as the ledge was so narrow. I was able to walk bent over. Once across, you clipped onto the abseil rope and went down the Skinny pitch, a nice abseil (41m) straight down the face into the open forest, being third, Jim asked me to traverse left a little to bring the line of the ropes over out of the scrub. For reasons unknown to me, dyslexic M traversed to the right into the scrub, realising once I got there that (again), I’d mixed up the right and left. So the rope went down into the scrub and everyone else followed that route (I guess Jim gave up trying to direct the others after his failure with me). 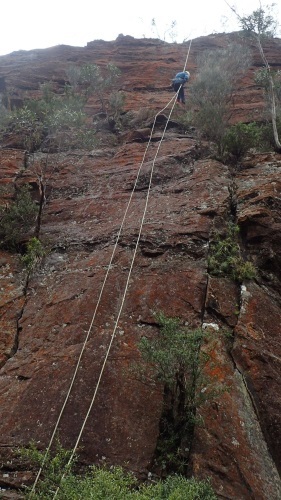 Skinny abseil taken from our lunch spot – puts everything in perspective! We were now at the base of the cliff-line, so walked along and up a slot to the top, where we had lunch with a great view. From the lunch spot we could see over to Skinny and that ledge that we had traversed, looked scarier from the lunch spot than it did when we were doing it! Aine noted that when a pitch gets a lot of action, you can usually see evidence of it from afar, but with Skinny, it didn’t look as though it was well used, although the track to it was well-defined. After lunch, we traversed around some pagodas and came to the Africa Walls anchor (nice chains guys), another really nice abseil (40m) down to a ledge where we had to carefully negotiate our way down a slippery slope to the anchor for Kilimanjaro. Jim put in a safety line for us to clip in to so, it was no problem at all. Kilimanjaro (50m) has about 10m of nice flat rock face and then a massive 40m overhang. 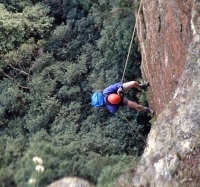 One of the nicest abseils I’ve ever done (but then I like overhangs). Everyone agreed that the last pitch was the highlight of the day. Even though we only did four abseils, it was a great day thanks Jim, and we were back at the vehicles by 3.30pm – a good work out walking up the slot and somewhere along the way I’d passed the hung-over stage! This entry was posted in Abseiling, UBMBC. Bookmark the permalink. I really enjoyed your trip report and the background to the abseils. look fun , when are we going? Like to keep you all on your toes! My dance card’s really full at the mo, they are good abseils though. Nice trip report M. Eli & I have done Kilimanjaro, Africa Wall and Sahara with the MSS guys back in 2009 and also had a great time. We really liked the “door swing” on Kilimanjaro! We were also checking it out with John Le’S.. before the above trip and we saw a guy on a slack line spanning the void between Devils hole area to the other side (Narrow Neck side). I have a couple of pictures but don’t know how to attach it to your blog. Let me know if you want copies. I suppose the next big Abseil you would be doing is the Multi pitch at the end of Mt Hay and exit via the Butter Box Canyon exit? I believe Klaus is keen. I have notes on this if you need it. Not sure I want to do that bit Mt Hay one, if it was really good you and Eli would have done it again! You can send me the pic of the slack liner if you like to my email address, I’ll drop it in. 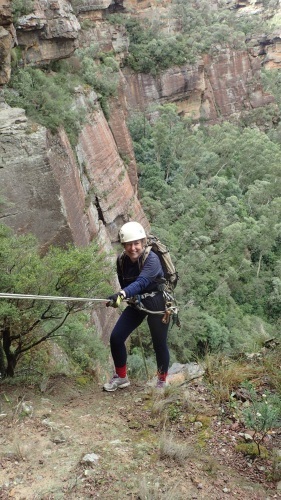 Yes, loved the Kili abseil! Wow apart form being cold and wet at the end, sounds like a perfect day! Love hearing about your trips! Keep the trip reports coming! Thanks Jen, am off this weekend for an overnight walk, hopefully wont be as cold as the last few weekends!